Romanian 274.005 (Henschel 14117/1916), briefly owned by Hungarian MÁV and handed over to CFR in September 1919. Location and date unknown. Source: www.beitraege.lokomotive.de. Due to insufficient capacities of indigenous locomotive manufacturers, Austro-Hungarian military railways (kaiserlich und königliche Heeresbahn – kukHB) ordered a number of locomotives from German manufacturers. In 1916 Henschel delivered 35 freight engines, with factory numbers 14113 through 14147, classed 274. They corresponded to Prussian class G71 (later PKP class Tp1) and differed only in details. Class 274 was a relatively simple locomotive running on saturated steam, with single-expansion steam engine, Allan valve gear and steam brakes. Although already obsolescent, it was very useful, due to low axle load and ease of maintenance. All locomotives of this type survived until the Armistice. Initially it was intended to divide them between Poland (seventeen), Austria (six), Hungary (six), Kingdom of Serbs, Croatians and Slovenians (SHS, later Yugoslavia, four), with single examples going to Italy and Czechoslovakia. After final rearrangements Austrians had to handle all their 274s to Poland; Hungarians took over the single Czechoslovakian engine, only to divide their share between Poland (three) and Romania (four). 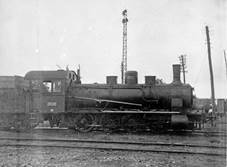 Thus, PKP were finally left with 26 locomotives of this type, classed Tp106 in 1926. Although almost identical to class Tp1, they were treated as being ‘of foreign origin other than Prussian or Austrian’, hence their new designation. To complicate things further, their tenders were treated as of Austrian origin and classed 12C15! All Yugoslavian 274s, later classed 23, were impressed into Italian state railways FS during the war; at least two were later returned. By contrast, the sole Italian engine of this type, re-numbered 425.001, saw no service and was withdrawn in 1923. All four Romanians locomotives retained their original service numbers and were written off before 1934. As for Polish Tp106s, all remained in use until 1939. After the September campaign DRG and NKPS took over thirteen examples each. German engines were re-numbered 55 5951 through 5963. Those taken over by the Soviets retained their Polish service numbers. Later eight of them became German war booty and were impressed into DRG as 55 5964 through 5971. After 1945 ten locomotives were returned and given new service numbers, Tp106-1 through 11 (for reasons unknown to me, Tp106-10 was missing). Three more, returned later, were not restored in service and scrapped. Post-war life of these engines was short. All were withdrawn from PKP between 1951 and 1953; three went to collieries and one to a power station. Not a single example has been preserved.